This weekend marked the 2nd (annual?) knitter’s retreat weekend for a bunch of us folk connected through the Toronto area knitting circles, and it was once again a great idea. It was like a big giant pause button. My sister came along for the first time and described it on the drive back as “knit, knit, drink, cackle, laugh, knit, eat…” and that’s about right, I think. Sort of like a Rhinebeck festival weekend, but without the festival. This year I did at least remember to bring my camera but developed a case of cam-nesia for much of the weekend. We watched DVDs, sat and knitted, ate and drank, and generally pressed reset before heading out again. 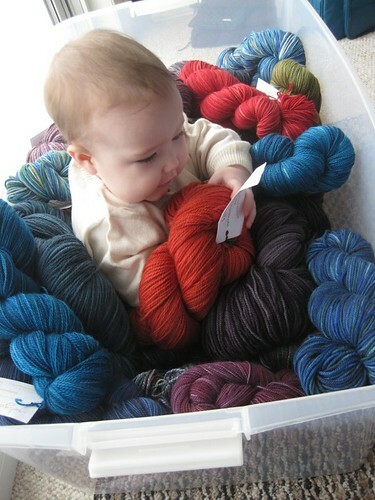 Before Sunday’s final sendoffs, little baby J was much encouraged in her future yarn addictions by a brief photo-shoot. Someone had to bathe in the tubs of yarn, right? And then she realized she could grab onto the things surrounding her, at which point she became oblivious to the knitterly paparazzi surrounding her. (You know she’s totally checking out the yardage. Need to make the right selection). I hope you have a good week ahead, dear knitters! I think you are right. Cute may be an understatement, as I think it’s absolutely adorable! OMG. That picture of her checking out the label is truly priceless. I wish I had a big bucket of soft squishy yarn to sit in. Now I want to go sit in my tubs of yarn. I usually kinda lurk on your blog, but I must delurk to say OH MY GOSH THE CUTENESS. Why am I not small enough to bathe in yarn? Also, did you make up “cam-nesia”? Because it’s super clever and I’m stealing it. I want to go and buy yarn after seeing that! Both yarn and babe are adorable! I think there is a potential fundraiser for a worthy cause: Come bathe in a tub of yarn! $5 for two minutes. What a fun way to spend the weekend! I love those pics of the baby in the yarn basket, so cute. Sounds like it was an amazing time!! 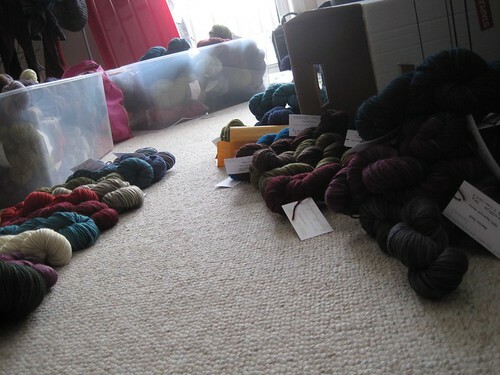 And indigodragonfly yarn is incredible, I’d have had a tough time hanging onto my wallet, for sure. That yarn cake is AMAZING. How was the icing done, do you know? Love the yarn cake. Babies sitting in tubs of yarn cuteness overload. I hope you’ll understand when I say I feel the need to go roll in some angora. Love the yarn cake, and the baby pics are so adorable. Thanks for sharing. Glad that you had a good time…the baby pics are darling. Super cute baby and wonderful cake! 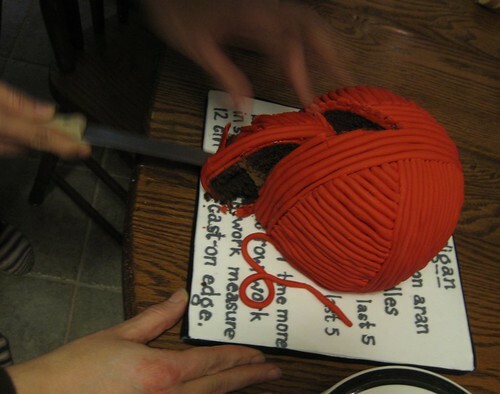 I need to figure out how to make a cake like that for my knitting circle’s upcoming retreat. The baby in yarn just MADE my Valentines day. Just goes to show you, it’s never to early to aquaint them with good quality yarn. I think I have enough in my stash to bath in, but alas, no tub. Babies and yarn…..what a fun day! What a cake!! I’m sure it tasted as good as it looked. I have been searching some knitting blogs abroad, just to get some new inspiration. Didn’t look yet further in your blog, but if you don’t mind I would like to attach your blog to mine to be able to see what new patterns you have come up with 🙂 Please don’t hesitate to visit my blog too. …and another knitter is born. Oh, that is the cutest picture! You just KNOW that baby will be a knitter! I think this is pretty brilliant. Such a cute little one in the yarn. I knit all the time and crochet and do all the normal stuff. really appreciate the craft. Both the yarn cake and the baby photos made me happy!! how cute! Sounds like it was a really fun weekend.